Prasad, G.; Rajput, R. & Chopra, A.K. 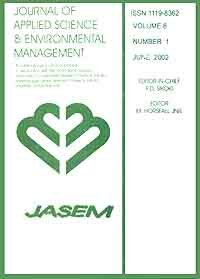 The present study was conducted to find out pollution reduction potential of Sand intermittent filtration bed in term of physico-chemical and microbiological characteristics of distillery effluent. The distillery effluent was filtered through Sand intermittent filtration beds of mixture of sand and soil at different ratio i.e. 1:1, 1:3, 3:1 and one set of 100% of each sand and soil were also taken. Results revealed that there was a significant pollution reduction in various physico-chemical and microbiological parameters of distillery effluent treated with sand and soil filtration. In general filtration bed containing sand and soil have shown better performance than filtration bed containing only sand or soil for distillery effluent. Maximum pollution reduction was found in the bed containing sand and soil ratio of 3:1 at 2 ft depth than all other ratios and depths. However declined trend of pollution did not remain same for several parameters in the same conditions. Maximum reduced value of pollution load for maximum parameters was recorded at 2 feet dept in sand soil bed of 3:1 ratio i.e. BOD 82.49%, COD 78.96%. Total alkalinity 75.32%, Turbidity 68.94%, Total solids 94.97%, Total dissolved solids 95.29%, Total suspended solids 94.16%, MPN 95.14% and SPC 67.21%. Maximum percentage of reduction in Temperature 59.55% was found at 2 ft depth in soil only. Maximum percentage of reduction in CO2 73.39% was found at 2 ft depth in sand soil mixed bed of 1:3 ratio. Minimum reduction ability was found in 100% sand bed.